Athleisure, it’s become one of the hottest trends in fashion ever since Lululemon hit the market. What exactly is Athleisure? It’s comfy, fashionable clothes that take you from the yoga, pilates studio or gym to the coffee shop in style. It’s the most brilliant thing for girls on the go. It blends form, function, fashion and beauty. Could we active gals ask for anything more? 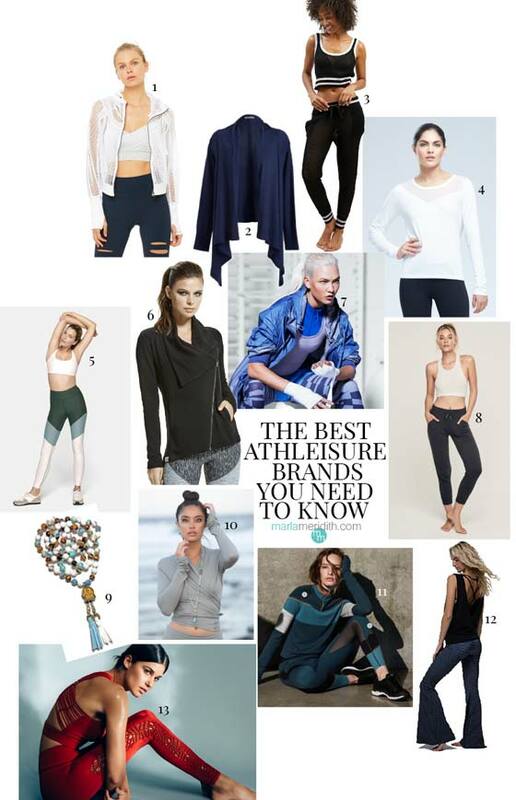 Here are a few of my favorite Athleisure brands that would look great on you too! 1. Alo Seamlessly takes your style from the yoga mat to the streets with this beautifully designed collection. 2. Naked Princess This cashmere wrap sweater is so cozy to snuggle up in, great for warming up and post-workout stretching. 3. Morgan Lane Cotton & cashmere blend fishnet & sweats take you from yoga to the pool club with ease. 4. Zobha means “grace, beauty and brilliance” which this line exudes all of that and more. 5. Outdoor Voices Their company goal is to inspire people to be active on a regular basis. As soon as you slip on OV you will feel the motivation to do just that. 6. Vimmia Loving the moto styling in this French terry jacket. 7. Stella McCartney for Adidas is stand out no matter where you roam. 8. Spiritual Gangster Be a peaceful gangster with this awesome line. 9. Sara Ward Jewelry This inspired collection of malas is designed by a beautiful yogi friend of mine. She splits her time between Telluride, CO and Honolulu, Hawaii. Sara combines her love of art and yoga with her handmade designs. 10. Lily Lotus This wrap is made from buttery soft bamboo fabric that will flatter all shapes and sizes, it comes in really pretty colors too. 11. Sweaty Betty has become a world-class brand with distinctive styling. This Power of Nature collection is made to brave the elements. 12. Onzie This line combines comfortable athleticism with whimsical details and prints. 13. Carbon 38 This website is filled with must-have, stand out pieces. The Sayang collection is one of the most exotic and beautiful.